A new, technologically-superior Soviet nuclear sub, the Red October, is heading for the U.S. coast under the command of Captain Marko Ramius (Connery). The American government thinks Ramius is planning to attack. A lone CIA analyst (Baldwin ) has a different idea: he thinks Ramius is planning to defect, but he has only a few hours to find him and prove it-because the entire Russian naval and air commands are trying to find him, too. The hunt is on! Won for Best Sound Effects Editing. Nominated for Best Film Editing; Best Sound. Tom Clancy�s Jack Ryan series never really turned into a megahit franchise, but after four movies spread over 12 years, it certainly has proven to enjoy a good level of success. Actually, the chronology is somewhat deceptive. The first three flicks came out from 1990 to 1994, but the fourth didn�t hit screens until eight years after that. Even with such a substantial break, the latest iteration � 2002�s The Sum of All Fears - found a reasonable audience and showed that old Jack (or young Jack, in that case) still had legs. 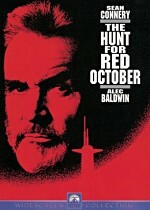 The first adaptation in the series, 1990�s The Hunt For Red October probably remains the most popular of the bunch. Set in 1984, we meet Ryan (Alec Baldwin), a bookish analyst for the CIA. He meets with his boss, Admiral Greer (James Earl Jones) after he checks out some surveillance pictures of a new Soviet sub. He sees some suspicious doors and wants to find out what�s up with this new model. In the meantime, we learn of the sub in question, the Red October, and its commander, Captain Marko Ramius (Sean Connery). As Ramius takes the crew on their maiden voyage, we discover he has an ulterior motive. Ramius kills the Soviet political officer Putin (Peter Firth) but makes it look like an accident. This puts Ramius in total control of the sub as they head toward the US. Occurring simultaneously, we encounter the crew of the US sub Dallas. Seaman Jones (Courtney B. Vance) detects a mysterious blip and tracks it with the endorsement of his superior, Captain Mancuso (Scott Glenn). Matters become more intriguing when the blip disappears and Jones needs to figure out what�s up with this strange new craft. The story takes a turn for the dramatic when a Soviet official gets a letter from Ramius. We don�t learn the contents of this missive, but the Soviet ambassador to Washington (Joss Ackland) tells the president�s National Security Advisor Jeffrey Pelt (Richard Jordan) that Ramius wants to fire the sub�s nuclear missiles upon the US. Earlier, Pelt gave Ryan the lead in the investigation, since Jack knows the most about Ramius. Ryan firmly believes that Ramius intends to defect, but his higher-ups remain suspicious. The rest of the film follows the race between US and Soviet forces to intercept and deal with the Red October and also to figure out what�s up with its commander. In an odd way, the structuring of October resembled that of the previous year's Batman. The nominal antagonists of the films - Jack Nicholson's Joker and Sean Connery's Ramius here - received top billing and dominated the pictures, while their purported heroes almost seemed like guest stars. Actually, the situation isn't as clear-cut with October if just because Ramius isn't really a villain, at least not in the mode of the Joker. I was still surprised at what a small role Baldwin's Jack Ryan seems to play in the movie. While he comes to the forefront at the climax, he almost appears like an afterthought much of the rest of the time. I think that appearance is due mainly to the large roster of characters and the convoluted plotting more than anything else. Plus, when Connery's around, everyone else has to take a back seat. That's not to imply he's a "film hog�. I mean simply that he's such a dominating presence that just having him around will almost automatically diminish the status of others. Whatever the various nuances or inequities of the actors, October functions as a pretty entertaining and suspenseful little thriller. Strangely, although it moves slowly and barely seems to progress at times, it held my interest easily and I rather enjoyed the experience. There's not a whole lot of slam-bang action until the climax, but the tone remains tense and vibrant. Director John McTiernan doesn't match the intensity and fervor of his previous effort, Die Hard, but he does well for himself in this stylistically different piece. The Hunt for Red October appears in an aspect ratio of approximately 2.35:1 on this single-sided, double-layered DVD; the image has not been enhanced for 16X9 televisions. One of Paramount�s earlier DVDs, October offered one of their more lackluster efforts, as they apparently just slapped an old laserdisc transfer onto the new format. That meant October rarely looked bad, but it didn�t present an image that offered the best that DVD had to offer. Sharpness actually provided a strength. The movie always looked quite crisp and detailed, and I noticed virtually no examples of softness. Unfortunately, this came with a price, as the picture suffered from many instances of jagged edges and moir� effects. The image often came across as rough and edgy, and many elements shimmered and strobed. Edge enhancement seemed surprisingly minimal, however. Print flaws caused quite a few problems as well. Grain seemed heavier than I expected, and other defects popped up frequently. Speckles and grit appeared throughout the movie. While they never seemed terribly excessive, they created more than a few distractions and gave the image a dirty look. On the positive side, colors seemed surprisingly bright and distinctive. The DVD demonstrated nice vividness and clarity to the hues, and even the most challenging situations caused no problems; the sub interiors handled red lighting with aplomb. Black levels appeared deep and dense, and low-light situations demonstrated good definition with no issues related to excessive opacity. If this transfer lost the nasty jags and shimmer plus the many print flaws, it�d seem quite satisfying even without anamorphic enhancement. As it stood, however, Red October only earned a �C� grade for picture quality. Happily, the audio presented a much stronger piece of work. The Dolby Digital 5.1 soundtrack of The Hunt For Red October offered a mix apparently created for a mid-Nineties laserdisc; from what I can tell, the film went to theaters for a Dolby Surround track, so the flick needed a rejiggering for 5.1. Many of those tracks don�t work very well, but October provided an exception, as it demonstrated a surprisingly high level of interactivity and quality. The soundfield showed a consistently positive sense of environment. The forward channels mildly dominated the piece, and they presented excellent delineation and separation. The front speakers remained in use through the majority of the movie, and they created a setting that was lively and realistic. Elements blended smoothly, and pieces moved cleanly across the channels. The surrounds appeared significantly more active than I expected for a film of this era. They presented lots of excellent material for both quiet and loud sequences. In one early shot, whale sounds emanated convincingly from the right rear speaker, and the channels neatly communicated the sense of being underwater during the many sub shots. The action scenes brought the surrounds to life as well, and other segments � like one in a shipyard � used all five channels with great effectiveness. Overall, the soundfield worked tremendously well to create an immersive environment. Audio didn�t seem quite as strong, at least in regard to dialogue. Speech periodically sounded somewhat flat and lifeless; they came across as a little too bass-heavy. I never found it tough to understand the lines, but they stood out as mildly weak compared to the rest of the track. Music appeared vivid and dynamic and showed nice depth and punch. Effects seemed really positive. They displayed no signs of distortion and they powered through the various scenes with great clarity and richness. Bass response was tight and distinctive throughout the movie, and the track gave my subwoofer more of a workout than I anticipated. The moderately problematic quality of the speech almost knocked my grade down to a �B+�, but given the age of the material and the high caliber of all other elements, I felt October deserved an �A-�; this was a very strong auditory effort. Only in the area of supplements does this DVD totally flop. We get the theatrical trailer, and that's it. Boo! When I first saw The Hunt For Red October back in 1990, I didn�t care much for it. However, I�ve come to enjoy the movie much more since then and now regard it as a pretty satisfying little techno-thriller. The DVD presented an erratic image that never became better than average plus a negligible set of supplements. The soundtrack worked tremendously well, though, and seemed superior to what I expected for a film from this one�s era. My initial review of this DVD recommended it, for although it suffered from various weaknesses, the movie remained good enough to warrant your attention. However, since then, Paramount decided to reissue the movie as a special edition. The set presented similar audio but offered moderate improvements in the areas of picture and supplements. It�s not a great disc, but it�s the one to have, so if you want to own Red October, skip this original release and get the special edition instead.